A new class of seven athletes from six different sports will be inducted today, joining a short list of other athletes and coaches. With a history as long as that of the University of Chicago, being inducted into the Hall of Fame is no small matter. The Hall’s members date back as far as the late 19th century, featuring athletes whose names are still commemorated today, such as J. Kyle Anderson, Amos Alonzo Stagg, and winner of the Heisman trophy, Jay Berwanger. This year’s class is headlined by Olympian Ned Merriam (A.B. 1908), who competed for the United States in the 1908 Olympics in the 440-yard dash. A three-time Big Ten champion in the 440-yard dash, Merriam took over as the head track coach at the University after being offered the position by Stagg, his former coach, who had decided to step down to focus exclusively on coaching football. Merriam would go on to coach Chicago for over 20 years, from 1929 to 1950. Merriam passed away in 1956 and is being honored posthumously at the event. Keith Parsons (Ph.B. ’33, J.D. ’37), the 1933 Western Conference medal award winner in basketball, is also being honored posthumously. Other inductees include Pat Barry (A.B. ’02), an All-American soccer player. He is the first male soccer player to be inducted. He led the Maroons to their first UAA championship in 2001, and was selected three times to the All-Central Region team. Barry received the Stagg medal in 2002, an award which honors the best undergraduate male athlete at the University. Two other athletes, All-American basketball player Eugene Ericksen (S.B. ’63), and track-and-field school record holder Bob Fisher (A.B. ’84, J.D. ’89), were also awarded the Stagg medal while they competed at the University. The equivalent award for female athletes, the Dudley medal, was awarded to both of this year’s female inductees, Renee Neuner (A.B. ’06), who was the NCAA D-III player of the year in soccer, and Margaret Pizer (S.B. ’97), who graduated holding 12 school swimming records. Ericksen, a math major, commented in an e-mail on the difficulties that athletes faced then, and still face, of grappling with academics while still competing at a high level. The Hall of Fame began in 2003, with the first class featuring 25 athletes, including Berwanger, Anderson, and Stagg. The selection process itself takes place over the course of the year. Individuals are eligible for the Hall of Fame five years after graduating or retiring, and are usually nominated by family members and former teammates scattered across the country. A 13-member Hall of Fame committee meets in early winter to collect the nominations, which are then divided by era. After that, the long process of research begins, which is no easy task. Digging up statistical information on people who competed when there were few written athletic records presents a unique challenge, which often sends committee members to sources like friends and teammates to provide information on lesser-known record-breaking athletes. “We had a swimmer a few years ago named Robert Smartt. He was a swimmer back here in the 1970s. He was nominated by a few people, but we didn’t have a lot of information on him and records were kind of sketchy. But as people started sending in some copies of Maroon articles, we got a couple letters from his coaches and other teammates at the time, that really pointed out how good a swimmer this guy was,” said Assistant Athletic Director and Sports Information Director Dave Hilbert of the 2008 inductee. In spring the committee reconvenes and members present their cases for the athletes from their era, accounting for the differences in the University’s athletic standing during that time period. 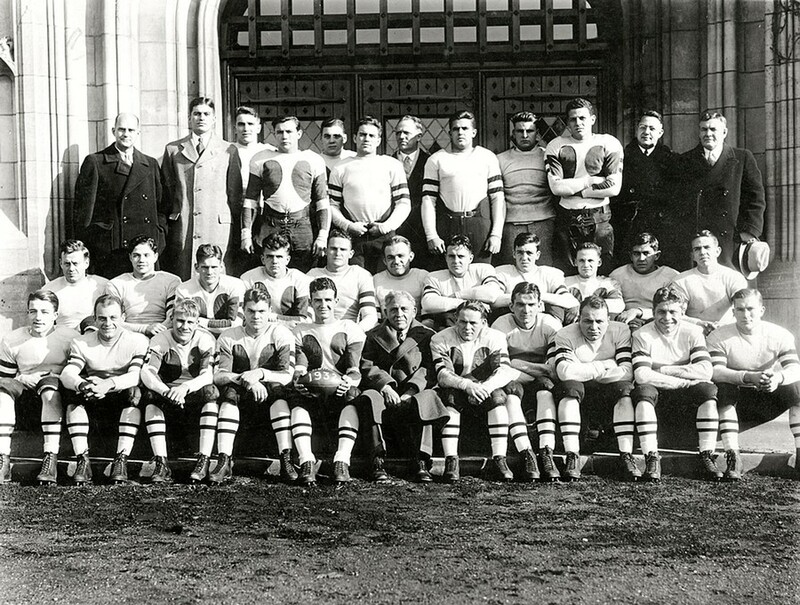 With an athletics history as unique and varied as the University of Chicago’s, this is sometimes difficult. “It was a legitimate question [when we were first forming the committee] because we’re sort of in a unique situation here,” Hilbert said. “There aren’t a lot of schools that were once D-I schools and are now D-III.” In order to account for this, Hilbert said that they weight certain accomplishments, like All-American, on equal footing across eras. The committee votes after the arguments for each athlete have been made, with athletes needing the magic number of nine “yes” votes to be inducted. Once they’ve been inducted, athletes are invited to the Hall of Fame induction ceremony and dinner. Lester Munson, a senior sports writer for ESPN, has headed the ceremony since it began in 2003. The Hall now holds 76 people, and will hold seven more at night’s end. “Other than a game, or winning the Nobel Prize, if there’s a better event at the University, I’d like to hear about it,” Munson said. The Hall of Fame induction dinner will begin tonight at 7 p.m. Inductees will be honored again at tomorrow’s Homecoming game against Kenyon.